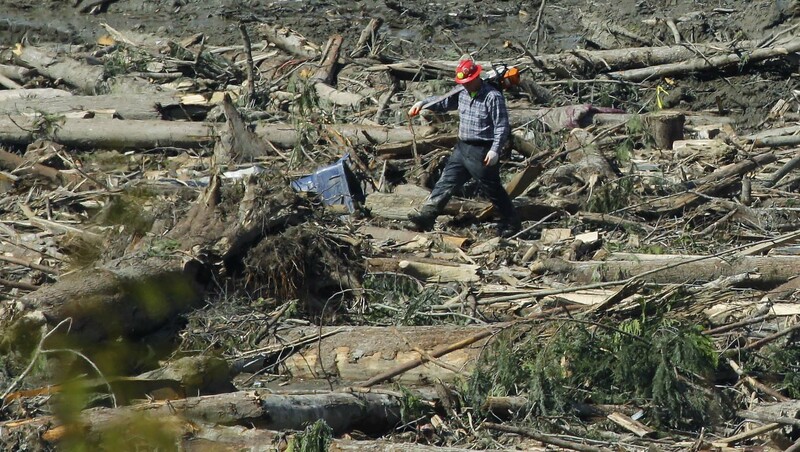 ARLINGTON, Wash. - Searchers combing through the muck-covered debris left by a massive mudslide are still hampered by unstable conditions and by chemicals, fuel and human waste contaminating the sites. The official death toll from the March 22 slide that buried the community of Oso increased to 28 on Tuesday evening with the Snohomish County medical examiner's office saying 22 victims have been positively identified. On Monday, the toll stood at 24 dead with 18 identified. The latest names added to the list were Thom E. Satterlee, 65; Lon E. Slauson, 60; and Adam Farnes, 23. Like the rest, they were killed by blunt force injuries in the accident, the medical examiner's office said. A CBS News crew visited the site Tuesday to get a first-hand look at the dangers faced by rescue crews and the dogs that have proven invaluable in the grim search. The Army has set up decontamination stations to hose down both workers and dogs as they finish their task each day. The muck and debris from the mudslide contains household chemicals, propane from heating tanks, and human waste. "We've already had a little bit of dysentery out here. People are working in a septic tank of materials. We want them washed and decontaminated," Lt. Richard Burke of the Bellevue Fire Department told CBS News. Sun has finally dried some of the muck at the site about 55 miles north of Seattle, and floodwaters from the backed-up Stillaguamish River were beginning to recede.While that made the recovery work somewhat easier, many obstacles remained. Crews have not been able to get to 100 acres -- one-third of the entire slide area -- because the quicksand-like mud can't be trusted. If crews were to venture into the zone, "it's so unstable, so wet ... it's 10-foot slurry, you'd fall right into it," Burke said. Drier conditions helped searchers, but as the mud dries it encases everything inside. "There's a lot of material that very likely isn't going to be recovered. It's just going to be buried there," said Steve Harris, who was supervising operations on the east side of the slide. Washington Gov. Jay Inslee says 31 homes were destroyed or are uninhabitable, with another 12 homes damaged. In asking the federal government to issue a major disaster declaration, Inslee said Monday that estimated financial losses have reached $10 million -- nearly $7 million in structures and $3 million in their contents. Inslee said about 30 families need assistance with housing, along with personal and household goods. He has also asked for federal help with funeral expenses for 48 people, although he said that was just a ballpark number.